CANYON COUNTRY — Nobody really knew what to call this place until Arthur Evans came along. Imagine saying you live in the "Acton, Agua Dulce, Forest Park, Mink [sic] Canyon, Newhall, Saugus, Sand Canyon, Sleepy Valley, Soledad Canyon, Solemint Junction area." It's not really a valley like the San Fernando variety. So Art got smart and dreamed up the name "Canyon Country." There's no telling if it will stick but the Mint Canyon Chamber of Commerce has used it in a fine map of the area. To most of us, Newhall and Saugus are little towns off the road on the way to Palmdale or the Mojave Desert. Canyons like Mint, Soledad, Aliso, Sand, Placerita and Bouquet are familiar in name only. Now that a portion of the Antelope Valley Freeway (U.S. 6) has been completed, the Canyon Country is well worth another visit if you haven't been there lately. Starting out in the Newhall-Saugus area, you're going to be surprised at the building activity. Just off Highway 6 past Newhall is the new community of North Oaks. A few years ago Signature Development Co. wanted to build some homes there but couldn't get any lending institution to come up with mortgage money. Even though Signature was one of the largest and most successful California homebuilders, the bankers thought there was "no market for homes way out that far." Signature would have had an easier time getting money to build a perpetual motion machine. Or buy the Brooklyn Bridge. Undaunted, Signature put up 100 homes with their own dough and they were a fast sell-out. You know, the bankers still weren't convinced; thought it was a fluke! Well, they've been convinced by now because more than 1,200 families live in North Oaks. Schools and churches are in and a $2,000,000 shopping center is on the way. The bankers now stand in line at the Signature offices with wheelbarrows full of $10,000 bills begging for a chance to lan money because "We knew all along this area would expand." When it's completed, 15,000 people will be living there! A year ago Signature opened up Friendly Valley, a 500-acre adult community. Some 6,000 senior citizens — I mean adults — will populate the place when it's finished. Farther on out, the Canyon Country is largely like it's been for years — rustic, peaceful and relaxed. While the big tourist attraction in Newhall is the William S. Hart Ranch, Vasquez Rocks near Agua Dulce is the place for kids to go climb up big rocks. Some of those grotesque rocks are 200 feet high. Years ago, this was a hide-out for bandits. Today, you're more likely to find Boy Scouts or Camp Fire Girls crawling over huge stones. There's even a set built for the "Bengal Lancers" television series for people to play in, on, over and through. In Soledad Canyon, the Southern Pacific station at Lang is a piece of history. In 1876, a golden spike was sunk there at the completion of the first rail connection between San Francisco and Los Angeles. At the Oak of the Golden Dream in Placerita Canyon is the site of California's first gold discovery. And Pico Canyon has the state's first oil well, while the original oil refinery was in Railroad Canyon. As a historical monument, it's called Pioneer Oil Refinery. A drive on the new freeway is a thrilling panorama of massive stone mountains. It contrasts sharply with Sierra Highway (U.S. 6) that has the usual collection of small stores and gas stations. Because much of the Canyon Country is in the Angeles National Forest, picnic and camp sites are numerous and scenic. In going through the many canyons, I put almost 200 miles on the Motolog car and saw enough to realize that many things about the area are like the San Fernando Valley 20 years ago. The Canyon Country may not look like Wilshire Blvd. today, but take a good look at what's happening out there. In 20 years, it will be another San Fernando Valley. Few areas I've driven have proved such a good car testing ground as the Canyon Country. 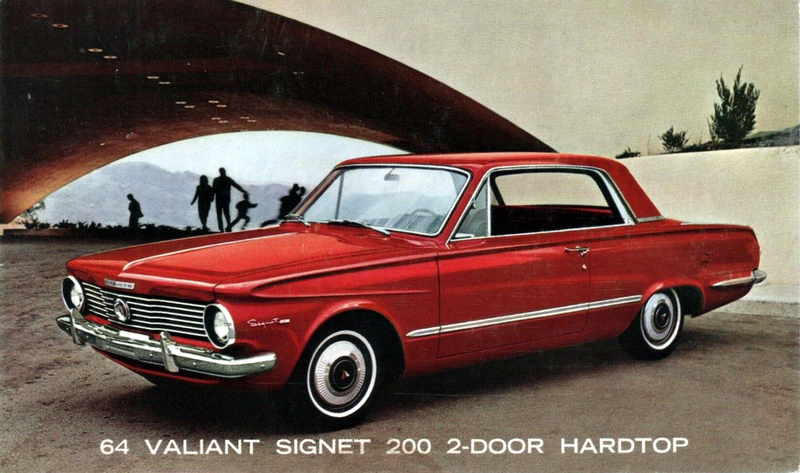 The Valiant Signet 200 hardtop got a full workout up and down hills, around curves, over dirt roads and on freeways. Since many of the hilly canyon roads are lightly traveled, I was able to take the curves at a fast clip. So how did the Valiant do? Fine! The top-of-the-line Signet hardtop is a $2,000 car that doesn't have to take a back seat to almost anything in its price class. The vinyl roof ($76) together with the special interior makes it one of the sharpest cars going. 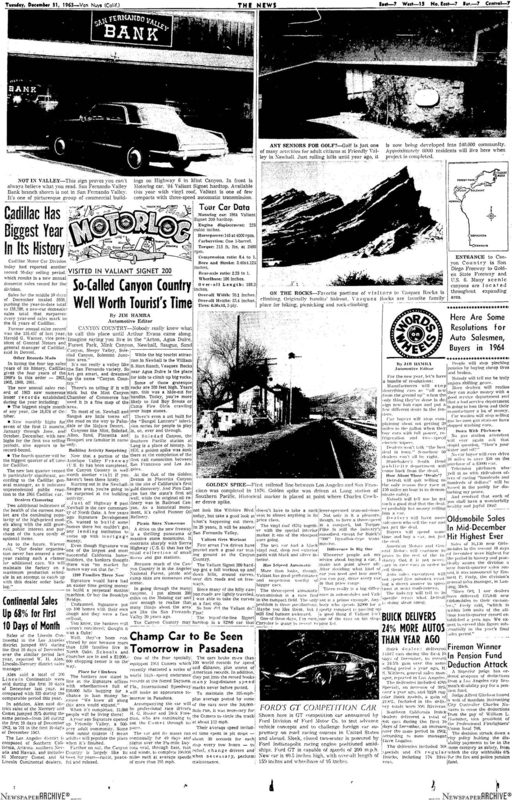 The test car had a black vinyl roof, deep red exterior paint with black and silver interior. More than looks, though, Valiant has good performance, and suspension worthy of bigger cars. The three-speed automatic transmission is a rare find in the compact field. The only problem is those pushbuttons. Maybe you like the, but I still find buttons awkward. One of these days, I'm sure, Chrysler is going to revert to lever-operated transmissions. Not only is it a pleasure, though, to have a three-speed in a compact, but Torque-Flite is still the industry's smoothest except for Buick's "300" Dynaflow-type transmission. Whenever people ask my advice about buying a car, I make one point above all: After deciding what kind of car you need and how much you can pay, drive every car in that price range. There really is a big difference in automobiles and Valiant is a prime example. Anybody who spends $2,000 for a sporty compact is passing up a good thing if Valiant isn't one of the cars on his shopping list.